A few of these long-term holding facilities may not be pasturing horses for the BLM today. In the fall of 2016 there was 31,588 in off-range pastures, 9,332 horses in off-range corrals, and 562 head in Eco-Sanctuaries. The on-range population estimate for wild horse and burros as of March 1, 2016 was 67,000 head. The appropriate management level is 26,715 head. Forty-thousand head of the on-range horses need gathered and sent to off-range holding(or better yet, sold!). 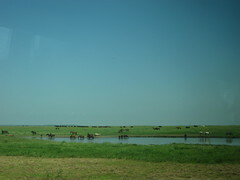 The grasslands of southeast Kansas and northeast Oklahoma are a horses natural habitat. They are in horse heaven. Compare these grasslands to the desert of the Great Basin.